Arthur Miller’s final play Finishing the Picture explores the manufacturing of female stars in Hollywood and their struggle to find their own agency within it. The first and only previous production of this play took place in Chicago in 2004, a few months before Miller’s death, and to describe it as a thinly disguised dramatisation of the end of his marriage to Marilyn Monroe on the set of The Misfits would be a gross understatement. The play itself is a pretty static thing, involving much talking in circles as to how to coax the radiantly beautiful and gifted Kitty (Monroe) out of her crippling self doubt and drug dependency in order to complete filming and save her from herself. Crucially, Kitty never appears on stage and has no voice, rendering her the kind of unknowable goddess/tormentor. 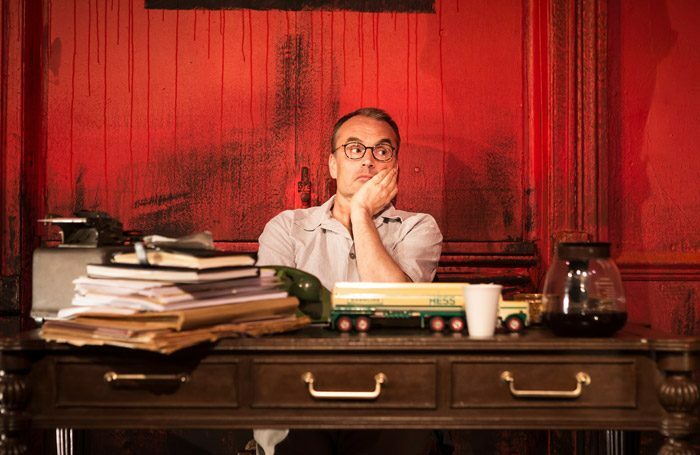 Phil Willmott’s production becomes more interesting in the second act, in which the red walls take on the mood of a madhouse and Nicola Chang’s discordant sound design speaks on Kitty’s behalf in response to her colleagues’ attempts to reason with her. Oliver Le Sueur captures the right balance of sympathy and smarm as producer Philip and Jeremy Drakes is convincing as screenwriter Paul, Miller’s long-suffering but un-saintly self-portrait. It seems possible that Miller found some catharsis in his lampooning of the insufferably pretentious versions of Lee and Paula Strasberg, and indeed the whole piece has the feel of an exercise to seek ‘closure’ for this chapter of his life.